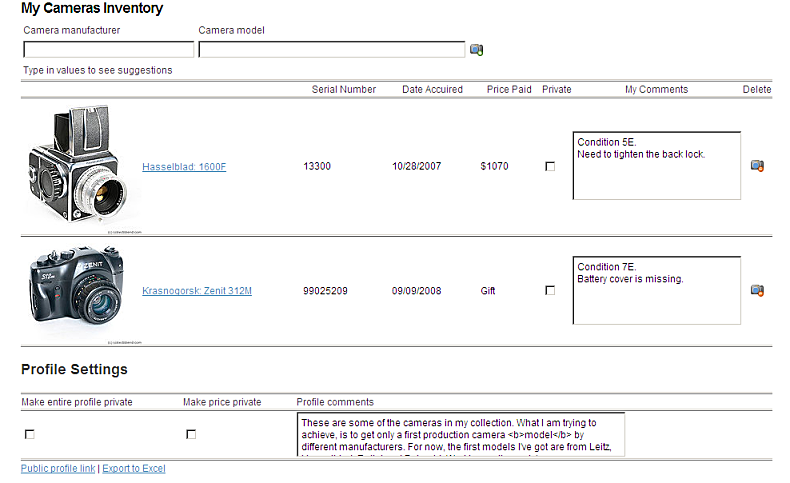 This forum topic is about a Personal Cameras Inventory/Showcase tool. - You can even add other equipment that does not exist in the database, such as lenses, backs, etc. Short manual: start typing the camera manufacturer in the input field, and the dropdown list will change accordingly. The same will happen for cameras. Click on the "add camera" button (the camera icon with the plus sign) when you are done. If you can't find the necessary manufacturer or camera, just type in whatever names you think are appropriate. To add date/price/serial number info, click on the "edit camera" button. To change the same info later, just click on "info" field. The same functions apply for comments/descriptions. Please note, that there is no "save" button, everything is saved automatically, just don't forget to press tab, enter, or click mouse somewhere else, outside of the input window. If you have any comments or would like to see some changes or additions, let me know. p.s. I'd like to add my photos (or links) too if possible someday. I added functionality of inserting images in the camera and profile comments using img tag. Will research the possibility of adding new images into the database. It sounds great but I can't make it work. Can you please write me a sample, please. Is there a possibility to set the order in which the camera's appear in the list. Like alphabetic or by manufacturer? In the list you edit, or in the public profile list? In the list you edit. Yes, there is way, click one of these links " Manufacturer" "Model" "Serial Number" "Date Accuired" "Price Paid" on the top of your cameras inventory.